Thickened fabric enables the grow bag to stand up, free your hands while filling soil. Proper thickness of fabric ensures good water drainage for water flow throughout the soil and root system while eliminating overwatering of the plants. The breathable fabric allows excess heat to escape so as to avoid overheat of the soil. The roots grow to the edge of the bag and are pruned, making for an extensive and healthy root system. No circling root. The bag can be folded and stored with minimum space when not in use. Non-woven fabric, a soft, felt-like texture, is durable and breathable. Sturdy and reinforced nylon handles, add mobility and decrease the risk of transplant shock. Durable construction ensures a more than 10-year service life, high quality is well warranted. 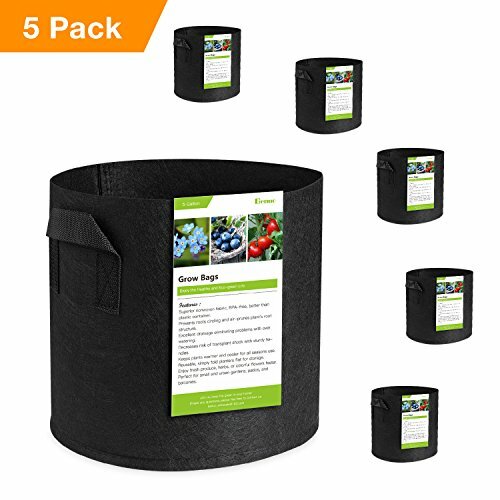 SUPERIOR MATERIAL: Crafted with 100% BPA free non-woven fabric, the grow bag is reusable, environmentally friendly, durable with over 10-year service life. EXCELLENT STRUCTURE: Unlike those traditional plastic and clay plant pots, Benuo grow bag drains well and allows the roots to breathe extensively, resulting in faster growth and grater plant vigor. AIR PRUNE - The roots growing in the smart fabric pot do not get entangled since they are automatically air-pruned, so the roots have more space for mineral and water absorption. LIFTING HANDLES DESIGN: For excellent mobility, the two reinforced handles make the plant container easy to pick up and move. SPACE SAVING VEGETABLE PLANTER BAGS: Use the grow bags in any seasons to plant potatoes, onions, taros, watermelons, flowers tomatoes etc. Healthier, cleaner and faster. If you have any questions about this product by Benuo, contact us by completing and submitting the form below. If you are looking for a specif part number, please include it with your message.